As turmoil and uprisings spread across the Middle East, so do their effects and consequences globally. In Libya, as American and other international forces work to protect citizens from the aggression of dictator Muammar Gaddafi, many are uncertain about the situation as a whole. As in Egypt, where former president Hosni Mubarak ruled for nearly 30 years, Libya’s Gaddafi has been in power for 42 years. Gaddafi’s tenure makes him one of the longest non-royal ruling leaders in world history, per rulers.org. Inspired by the events in Tunisia, Egypt, and other surrounding Middle Eastern countries, Libyan citizens have sparked a bloody civil war. As of March 7, the total number of casualties is estimated to have exceeded 2,000. OCCC students such as Martin Bronaugh, music major, agree that assistance is justified for the citizens of Libya. “When citizens are being killed for no reason by their own government is when we should probably give a helping hand to the citizens of that country,” Bronaugh said. Aside from the serious issues within Libya, the ramifications of the events are felt here in the U.S.
One major economical consequence stands out everyday as we fill up our gas tanks. According to the U.S. Energy Information Administration, the average price for a gallon of gas in America is now around $3.68. Germain Pichop, business and economics professor, said the events unfolding in Libya can certainly be blamed for the escalating gas prices. “Because of the world dependence on oil from the Middle East, the rise of the price of oil is a direct consequence of the instability in the region,” Pichop said. 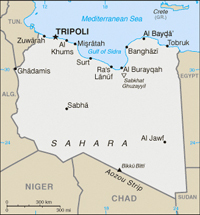 Pichop also noted that Libya produces approximately 1.8 million barrels each day. The problem with this, however, is that Libya’s oil production has since ceased, he said. While questions regarding the U.S. economy float around the water cooler, similar questions are raised pertaining to an eventual economic recovery for Libya as well as the entire Middle East. “A strong government which demonstrates good governance, respects the rule of law, and respects both economic freedom and the freedom of expression will be necessary to build up the confidence needed for economic recovery,” Pichop said. Before the economic situation sorts itself out, Libyan citizens just want to be free. Thabet Swaiss, adjunct Arabic professor, said the recent revolutions are nothing but good for the citizens. “We should support democratic movements by the people throughout the Middle East region … and not support ruthless, un-democratic, outdated and unpredictable dictatorships,” Swaiss said. In pursuit of removing repression, he said, both Libya and the rest of the world can only hope for a speedy transition. “Unfortunately, change will take a very long time,” Swaiss said.